Joint Venture Apprenticeship can be another lifeline for those who want to put their real estate investments on steroids. A Joint Venture does not mean only money, but participation in a project in more than one way. A Joint Venture Partnership involves each partner bringing forth a skill, money, land, syndication or expertise. Joint Ventures are quite common in larger projects but can also be utilized on a much smaller level, even when you are purchasing a single family home. A joint venture must be made in writing with all deadlines and clauses stated. A separate legal opinion must be attained by all parties concerned. The joint venture agreement must be registered on title unless otherwise agreed upon by all parties. Forms of due diligence include the inspection of the property, appraisals, projections, costs and miscellaneous expenses on or before signing the joint venture agreement. Upon successful completion of the project, disbursements must be accounted for and gross/net profits must be awarded to the concerned parties. Joint ventures in Real Estate can be the first stepping stone to creating your empire. Before you choose a project and or a joint venture partner, make sure that all parties are aware of the pitfalls and risks involved such as; inflation, market booms and busts, devaluation of property values and any other circumstances. Being optimistic is definitely helpful because if everything goes as planned, all parties will benefit a great deal. Joint ventures will allow you to fill in any resources either tangible or intangible where you may be lacking. They create a win-win situation because you are participating in a project where others will be bringing either money, expertise, land or even the project itself. To learn various strategies and techniques for taking part in joint ventures in Canada with a wealth of knowledge and expertise, Canadian Wealth Builders offers a two day intensive Joint Venture and Partnership Apprenticeship training. 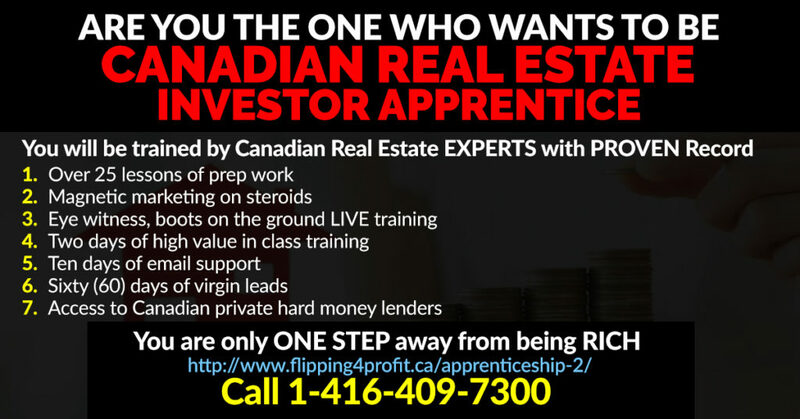 This apprenticeship will open your eyes to achieving phenomenal wealth.